SINGAPORE CENTRAL: Is IAEA a farce sometimes? Is IAEA a farce sometimes? VIENNA (Reuters) - Tests by the U.N. nuclear watchdog appear to confirm that traces of weapons-grade uranium found in Iran came from abroad, reinforcing Tehran's assertion it does not seek atomic weapons, a diplomat said on Sunday. The International Atomic Energy Agency has said the issue of contamination is one of two main outstanding questions in its two-year investigation into Iran's nuclear program. 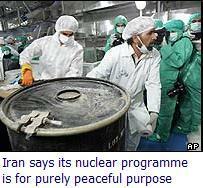 Tehran insists the program is peaceful, but Western countries suspect it may be a front for developing nuclear weapons. An analysis of Pakistani components for enrichment centrifuges identical to ones Iran bought on the black market appear to back Tehran's assertion that traces of bomb-grade uranium were the result of contamination, a Western diplomat familiar with the IAEA said. "There's still some final corroboration to go on but all the preliminary analysis does show that the particles seem to have come from Pakistan," he said, adding that the final result was unlikely to change as a result of work still outstanding. This appeared to confirm earlier results, reported by Reuters on June 10, that also suggested Tehran did not produce the highly-enriched uranium itself. 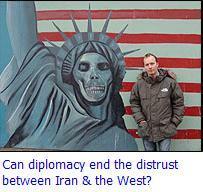 Asked whether this cleared up the contamination issue, the diplomat said: "More or less. The contamination issue will never be 100 percent clear." The IAEA declined to comment. Diplomats say several other questions about the nature of Iran's nuclear program remain, including the extent of its work with advanced P-2 centrifuges and the scope of its experimentation with plutonium, which is usable in an atom bomb. "All declared (nuclear) material in Iran is under verification, but we still are not in a position to say that there is no undeclared nuclear material or activities in Iran," IAEA chief Mohamed ElBaradei told reporters after an emergency meeting of the IAEA's governing board last week. "With regard to the country as a whole, the jury is still out," he added. France, Britain and Germany called the emergency IAEA board meeting after Iran said it would resume uranium conversion -- the step before enrichment, a process that purifies uranium to levels at which it can be used in power stations or bombs. Iran resumed conversion last Monday and broke U.N. seals on machinery on Wednesday to make its conversion plant near the central city of Isfahan fully operational. The 35-nation IAEA board reacted by urging Iran to resume a suspension of nuclear work usable in an atomic bomb program, including conversion, and expressed "serious concern" at Iran's move. The trio of European states and Iran are due to meet at the end of August, in hopes of defusing a crisis in which Iran has rejected a European package of economic and political incentives aimed at convincing it to abandon sensitive nuclear technology.